A Paradise Vacation in Wailea, Maui, Hawaii. 3378 Keha Dr. Maui Meadows, 96753. The Hale Alana Vacation Home is a beautiful, spacious, Polynesian style home with three bedrooms and three bathrooms, two of which are master bedroom suites. This lovely vacation rental is situated on a 1/2-acre tropical estate, with a spectacular lava rock pool and waterfall. From nearly every room of the house and from the 72’ deck you have totally unobstructed views of the ocean, several islands, and glorious sunsets.. You can even spot the whales during their annual visit from December to April. Hale Alana has central A/C; four color TV’s, DVD and CD players, phone, a fully equipped kitchen, open dining room, sunken living room, breakfast bar, laundry room, outdoor shower and a two-car garage. The main outdoor features are the Lava pools (unheated) and waterfalls, nestled in tropical gardens. There is of course a BBQ and hot tub on the lanai for your evening entertainment as you savor the warmth and views in this spectacular setting. 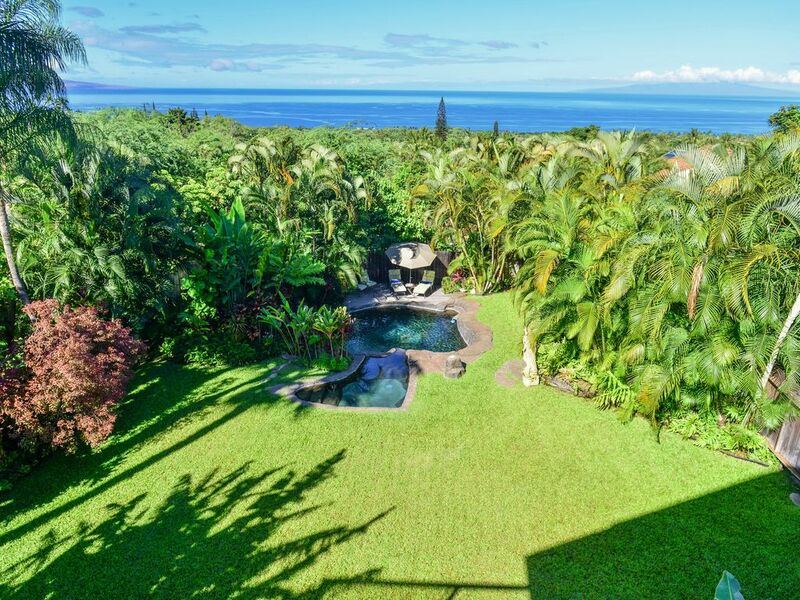 Hale Alana is a fully permitted vacation home situated in the residential neighborhood of Maui Meadows, JUST A 5-10 MINUTE DRIVE from the beaches of South Maui, which are considered by many the most beautiful in the world. With our year-round tropical climate you can easily take advantage of the many recreational activities that Maui has to offer: snorkeling, hiking, tennis, golf, bike riding, local and international culture and cuisine. You also have quick access to some of the island’s best hotels, restaurants, and shopping, all in the Wailea/Kihei area. Pools accessed at bottom of driveway. Tenant cottage situated at bottom of property per Maui County Law. Garden/Pools are solely for the use of the house guests. Come enjoy a Hawaiian vacation at Hale Alana, “House of Awakening” and relax into the heart of the Valley Isle. Cleaning fee $350 Home accommodates 7 persons. wonderful views. pool is awesome in afternoon heat. A/C in guest room broke, this was inconvenient but able to work around. What an amazing rental....kitchen was super equipped with every possible appliance/cooking needs. The home is designed with two master suites, allowing for quiet time when necessary. The deck allowing for cool morning views with a cup of coffee in hand. The manager was always readily available. The location perfect for a trip to the beach, out for dinner and the grocery store. We would DEFINITLY suggest this home as a wonderful vacation rental ! This house is absolutely beautiful. It has an amazing view of the Ocean and sunsets and while it is quite close to all amenities it also retains its quiet seclusion in a neighbourhood very close to Wailea and Kihei. It has a fully stocked kitchen and 3 lovely bedrooms. It also has a huge back yard that your kids can play in and a nice private pool that is perfect for hot days as it is nice and cool. Theres a hot tub on the deck to warm up in and enjoy the breathtaking sunsets! This was our second visit and we are already planning our third. Martha is responsive and lovely to deal with! We would highly recommend!!! Yes, we are on a roll for the 3rd year. I love hosting this family. the house, grounds, and management exceeded our expectations. with all the proper appliances. Mahalo for this great review and for sharing your 50th anniversary with us. We look forward to your visit this fall for another fun adventure...champagne awaits you. We had a great time enjoying the views from the hot tub and look forward to returning next year. This is a very well designed and maintained property. The property descriptions and photos were is just as lovely as advertised. It is fully stocked with all supplies, including everything you need for a day at the beach. If we ever come back to Maui, this is where we will stay. All of the beaches of South Maui are at your doorstep. Starting with La Perouse Bay all the way to the Kamaoles Beaches 1,2,3. Final deposit for Hale Alana is due in check format.